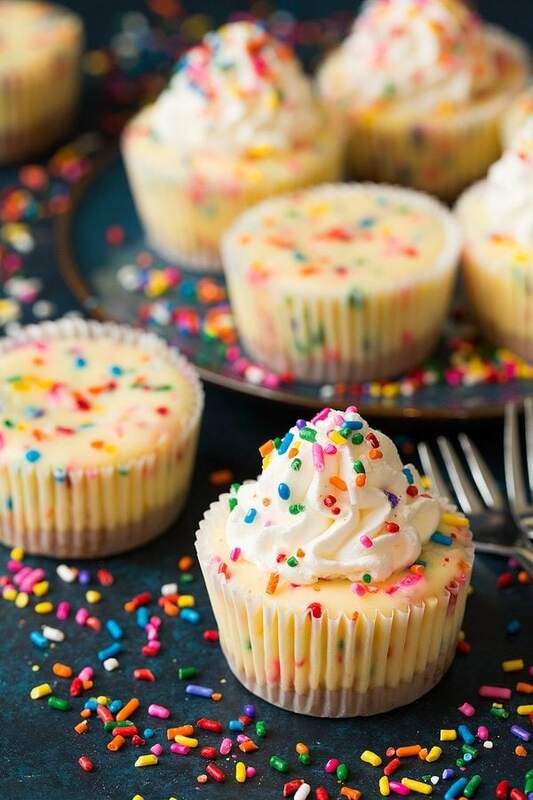 Funfetti Mini Cheesecakes are the perfect way to celebrate any occasion! They’re perfectly rich and creamy, they have a sweet funfetti flavor, and people of all ages just love them! I mean who could resist these fun individual portions and all those colorful rainbow speckles? Funfetti Birthday Cake Meets Cheesecake! 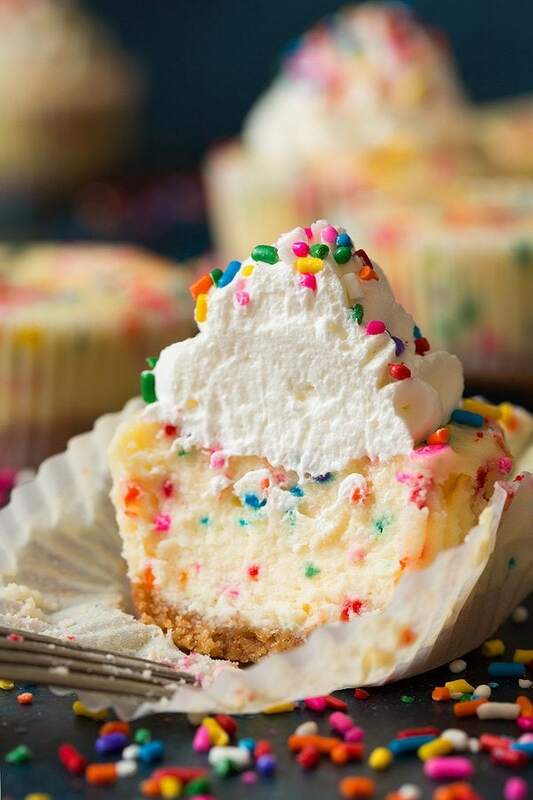 Instead of making a funfetti cake for an upcoming birthday or party you’ve got to try these fun funfetti cheesecakes! 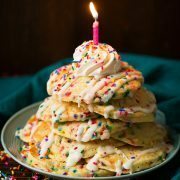 They are a fun change from the traditional funfetti cake, they still have that same classic flavor plus the added decadence and flavor of cheesecake. No one can resist! With these you start out with a crisp, buttery, vanilla wafer cookie base. Then top that with a rich and luscious, perfectly sweet and creamy, rainbow dotted, almond and vanilla flavored cheesecake! 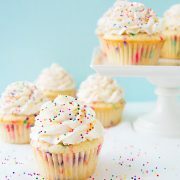 The almond extract and vanilla extract give it the typical funfetti flavor by the way. Everyone will be wanting the recipe! Make the crust by mixing crumbs, butter and sugar. Bake in paper lined muffins cups. For the filling mix sugar and flour, pour over cream cheese in a bowl. Blend in eggs then sour cream, heavy cream and extracts. Pour filling over crust layer. Sprinkle with a few more sprinkles. Bake until nearly set, let cool. 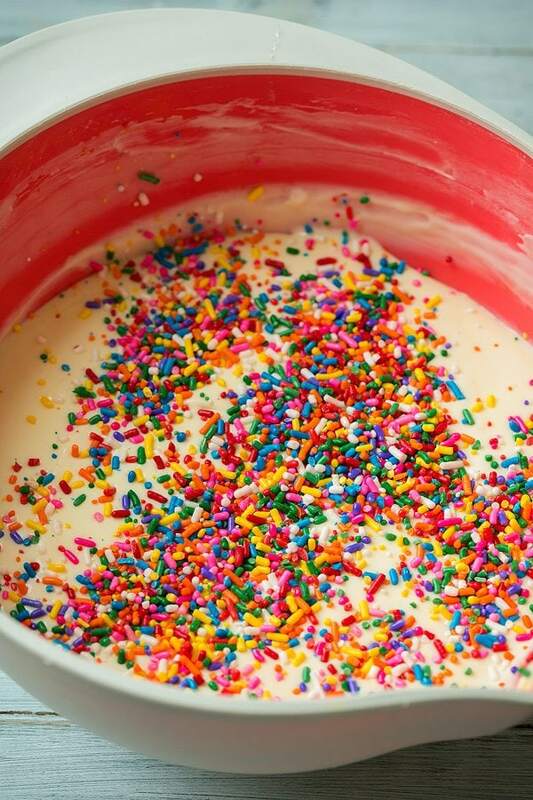 They’re actually really easy to make and fun too, because anytime you bake with sprinkles it’s a great time! I ended 2016 with a Cookies ‘N Cream Cheesecake and I’m starting 2017 out with these Funfetti Cheesecakes. It’s true, I really really love cheesecake. And there’s even more beyond all those. I’m slightly obsessed. 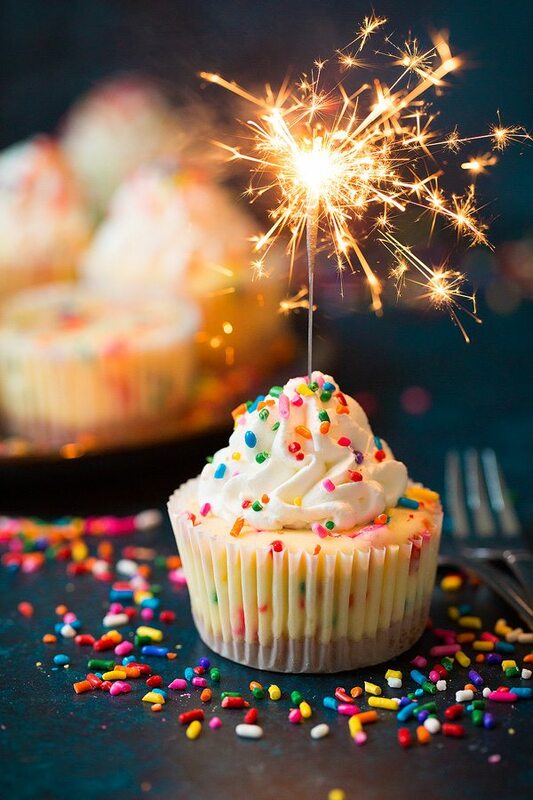 I’m sure the future holds more I haven’t tried yet but for now I’m seriously enjoying these party perfect mini sprinkle filled cupcakes and I’m already looking forward to the next time I get to make them. Happy 2017 everyone! I hope you have a fabulous year! 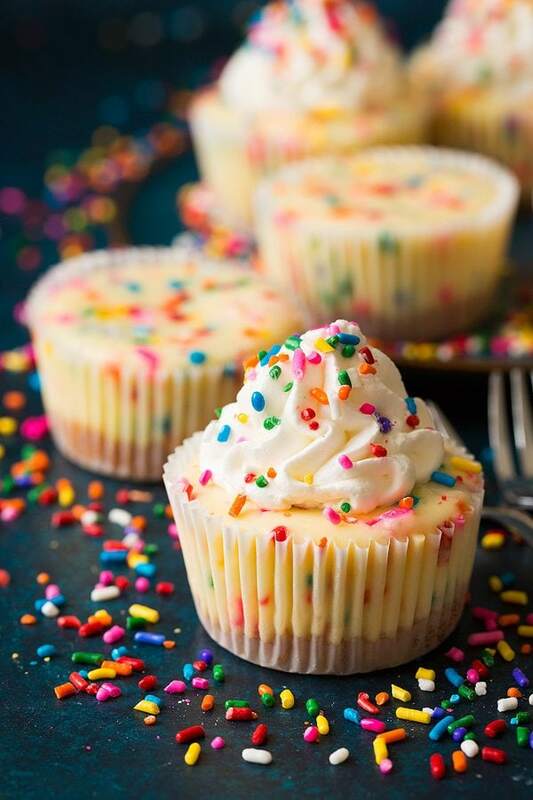 These rainbow flecked individual cheesecakes are the perfect way to celebrate any occasion! 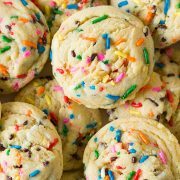 They're perfectly rich and creamy, they have a sweet funfetti flavor, and people of all ages just love them! I mean who could resist these cupcake portion and all those pretty colors? For the crust: Preheat oven to 325 degrees. Line 12 standard size muffin cups with paper liners. In a medium mixing bowl whisk together cookie crumbs and sugar. Pour in melted butter and stir with a fork until evenly moistened. Divide mixture among prepared muffin cups, adding about 1 heaping tablespoon to each. Press crust into an even layer in each cup. Bake in preheated oven 6 minutes then remove from oven and let cool. For the filling: In a small mixing bowl whisk together sugar and flour. Add softened cream cheese to a separate large mixing bowl. Pour sugar mixture over cream cheese and using an electric hand mixer cream together just until mixture is smooth, while scraping sides of bowl occasionally, about 30 seconds. Mix in eggs one at a time blending just until combined after each. Mix in sour cream, heavy cream, vanilla extract and almond extract. Pour in 1/4 cup of the jimmies and fold batter with a spatula just to evenly distribute. Divide mixture among muffin cups pouring over crust layer and filling each cup nearly full. 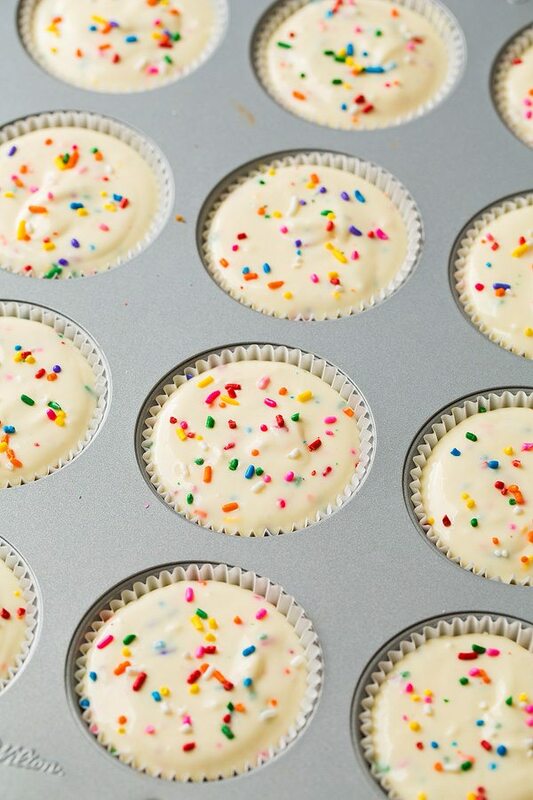 Sprinkle tops with remaining 2 tsp sprinkles. Bake in preheated oven until cupcakes only giggle slightly, about 20 minutes (they may crack just a little but that's fine, they'll deflate and cracks shouldn't be visible). Let cool at room temperature 30 minutes then transfer to refrigerator and chill 3 hours (preferably rest a 13 by 9-inch cake pan lid over muffin pan - one that doesn't touch cheesecakes, don't cover with plastic wrap or it will stick). Serve chilled with whipped cream and sprinkles. Danielle Letendre: I tried these and they were amazing! My boyfriend wants me to try and make it as a whole cheesecake instead of little mini ones. Would you happen to know the amounts for that?